Carl Froch has delivered a backhanded compliment to George Groves, who announced his retirement at the age of 30 this week. Writing in a column for Sky Sports, the former WBC, WBA and IBF super middleweight champion said he wouldn’t miss his former foe who he defeated in back-to-back fights before retiring in 2014 with a record of 33-2 (24). “Will I miss him? Probably not,” said Froch. “But I can’t deny that Groves made a massive, positive impact on the end of my career. Between us we filled Wembley and raised the bar for the next generation, led by Anthony Joshua of course, to box there, regularly. 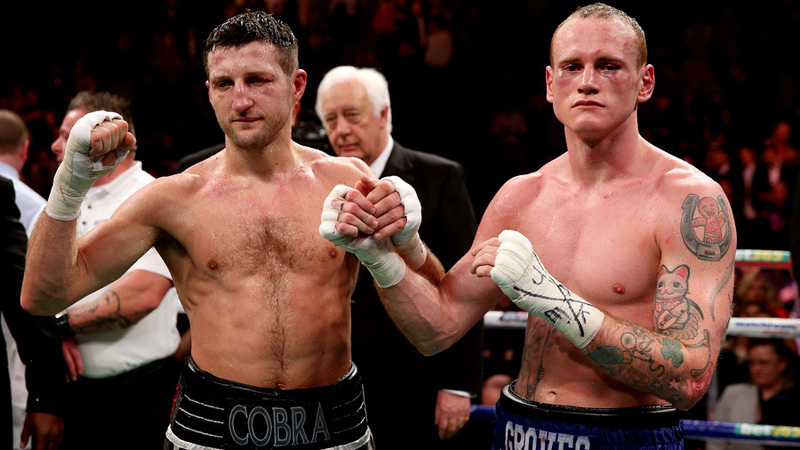 Froch and Groves had a heated rivalry that led to a pair of classic battles in 2013/14. Froch won both those bouts by TKO. Hammersmith’s Groves claimed the vacant WBA super middleweight championship against Fedor Chudinov in May 2017 with a TKO6 victory in Sheffield. In his last bout he was knocked out in seven rounds by undefeated Callum Smith last September. Froch couldn’t resist one last dig at his old rival. “But I won’t miss him and I am not sure that British boxing will miss him, these days at least. There was nothing left out there for him,” he said. “He lost to Callum Smith, who is now top of the super-middleweight world and it wasn’t like it was a close or controversial defeat, he was conclusively beaten and there was never going to be a rematch.